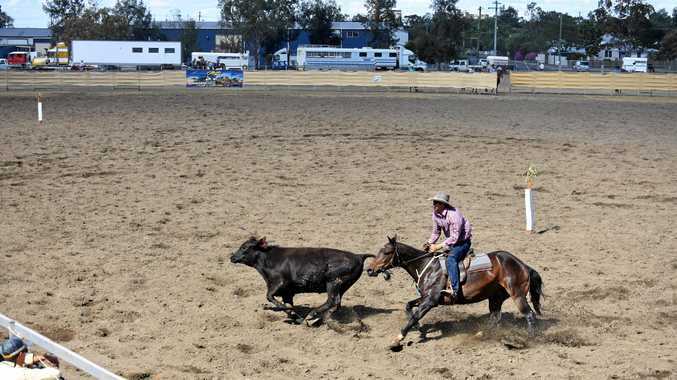 NOT just a sale of horses, the 44th annual Dalby Australian Stock Horse Sale brought with it campdrafting events with plenty of cash prizes at stake. Darling Downs Stock Horse Society president Jim Ryan said the event brought many happy people into the showgrounds. Campdrafting incentives that ran on Friday offered categories including the Open, the Future Champions incentive, the Donrica Stock Horse Stud Gelding incentive and the Australian Stock Horse challenge. Josh Hurley, riding Kirkby Stud Regal, won first place in the $30,000 Open, taking home an impressive $10,000 in prize money. The Five and Under Future Champions Campdraft was won by Luke Collman, who took home a tidy $2200. "All horses that are five years an under compete in that category,” Mr Ryan said. Craig Davison won the title in the Six and Over Aged Champion category and scored himself $3800. In the Donrica Stock Horse Stud Gelding category, David Bassingthwaighte came out on top, pocketing prize money to the amount of $3000.